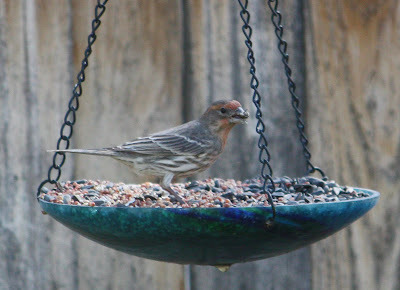 Normally, this is house finch season around my yard. But this type of finch has been scarce this year - while goldfinches, pine siskins, house sparrows, red-wing blackbirds, yellow-headed blackbirds and Brewer's blackbirds have ruled the yard. This one's beak looks strange. I think it's just a piece of seed shell. I think this little fellow needs a dinner napkin with his meals. :)Cute photo.